I found Cynthia very professional and skilled but also a very fun person to work with. I've really used what I learned in my daily contacts with my non-Swedish speaking colleagues within the bank. Av alla år som jag läst engelska så har lektionerna med Cyntha givit mig mest. Jag har fått den kunskap som jag behöver idag och inte det som står i en läroplan i vanlig skola. Det är den bästa engelskakurs jag läst och Cynthia är en fantastisk lärare. Hennes lektioner är både underhållande och lärande på ett sådant sätt att information sätter sig. Cynthia is a very skilled teacher who can easily explain grammar and give good examples to illustrate her point. She created an easy and relaxed atmosphere and made everybody have a great time while learning. I always looked forward to Cynthia's classes since not only did I learn a lot, but we also had so much fun. Cynthia helps people with their English. People say that they enjoy working with her. She knows this because she asks them, and they tell her. Cynthia is an American originally from the New England state of New Hampshire. 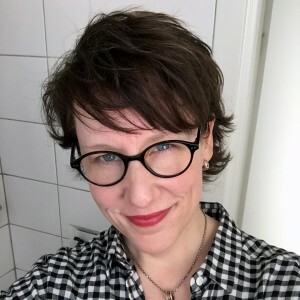 She has lived in Sweden since 2000 and has worked full-time as a professional general and business English trainer and consultant for a number of language companies in the Stockholm area. She earned her Bachelors of Science in Communication Disorders from Boston University and a Masters of Arts in Audiology/Hearing Sciences from Northwestern University in the Chicago area. She worked in the medical field in the US for five years before moving to Stockholm. She is certified in Teaching English as a Foreign Language (CTEFL) and Teaching Business English (CTBE). She also speaks French fluently due to being brought up in a bilingual household (her mother is from Quebec, Canada) and is proficient in Swedish. She started Cyntactic in 2004. In her free time, she enjoys improvisational comedy and acting. She is an advanced student performer and teacher at ITS (International Theater Stockholm). She also knows her way around designing a website (she has put this one together herself).